TV show dates: February 13, 2018 — February 22, 2019. 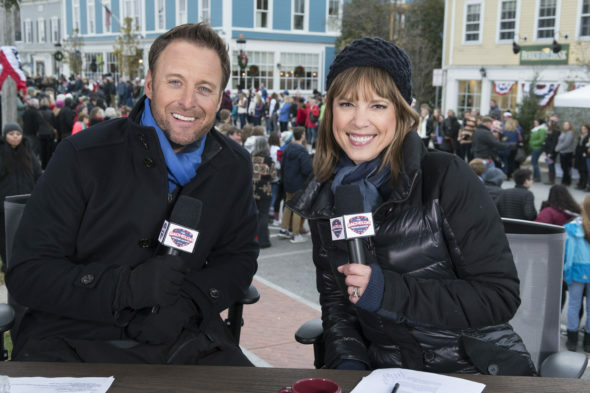 Performers include: Chris Harrison (host); Hannah Storm and Ashley Brewer (correspondents). A dating reality TV series and sports competition combined, The Bachelor Winter Games TV show features participants from The Bachelor and The Bachelorette on ABC, as well as contestants from international versions of the popular franchise. These singles will face off in wintertime challenges — all for another chance at love. The series follows the bachelors and bachelorettes as they compete in winter biathlons, ice dancing, speed skating, and other winter-themed games. Winners of each challenge will receive date cards. A date card provides the holder with the opportunity to invite a potential mate on a date. As with The Bachelor and The Bachelorette there are rose ceremonies, eliminations, romance, and tears. Still, will they manage to find true love? Stay tuned. A reunion of bachelors and bachelorettes who participated in the series. First aired: February 22, 2018. What do you think? Do you like The Bachelor Winter Games TV series? Should this TV show have been cancelled or renewed for a second season on ABC? More about: ABC TV shows: canceled or renewed?, The Bachelor, The Bachelor Winter Games, The Bachelor Winter Games: canceled or renewed?, The Bachelor Winter Games: ratings, The Bachelor: canceled or renewed?, The Bachelorette, The Bachelorette: canceled or renewed? Well I did watch but really it was just like the other shows. Bachelor crying, fighting, talking about each other…..